Add oil and garlic and saute for 2 minutes. Add bell pepper and onion. Add salt and paprika and continue to cook one more minute. 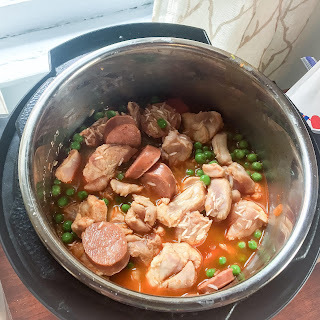 Add sausage and chicken and cook for 5 to 6 minutes. Add chicken stock, scrapping up bottom of the Instant Pot. Add the remainder of the ingredients, make sure the rice is completely in the liquid. The original recipe uses saffron. I haven't bought saffron in years, the recipe would probably be better with a pinch, but I left it out. I keep my food budget pretty strict and with two growing boys, I spend more on making snacks than expensive spices. I found that this was best the same day. The leftovers reheated well in the microwave, but this dish was delicious right out of the Instant Pot. I feel this way with most chicken recipes. Reheated chicken just doesn't taste as good as the same day it's cooked. This is made for a 6 quart Instant Pot. However, I'm cheap and have a 3 quart Instant Pot. I use my 3 quart for a lot of recipes. As long as it doesn't go above the cooking line, it's fine. I like that this makes enough for a week of lunches. Making meals with enough leftovers is a must for my food budget. I feel like this could benefit from a little heat, maybe a bit of Tony's or hot sauce when served. 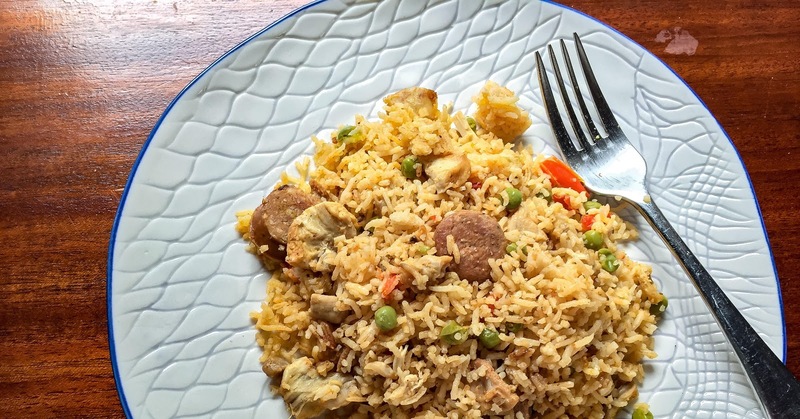 Recipe adapted from Chicken Paella. My herb garden can have good years and bad years. This year was somewhere in the middle, not great, not horrible. Too much rain in the beginning of the year and too little in the last couple of weeks. However, I have still had more than enough of an abundance to freeze and dry. Here is a quick rundown of how I keep my herbs useable year round. This works for any woody perennial herb, such as rosemary and sage (thyme, marjoram). Pat dry with paper towels (or use a salad spinner which works great). 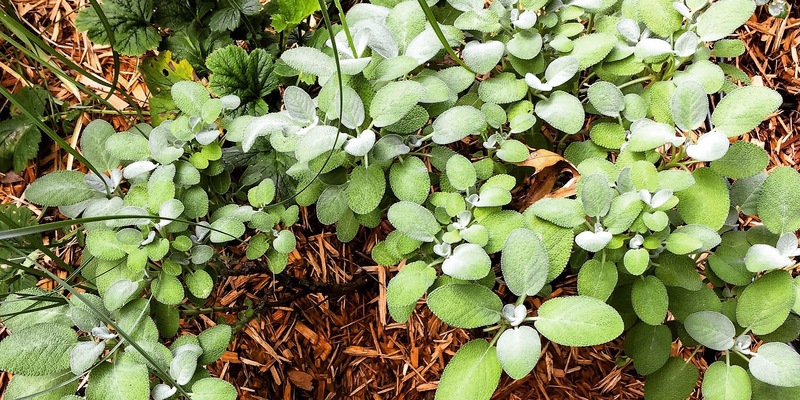 Try to get off as much moisture as you can in order that the leaves (especially with sage) don't stick together. Spread the stems (or with the case of sage I just freeze the leaves) on a cookie or jelly pan and place in the freezer for 15-20 minutes. Try to spread out the herbs as much as possible. This will allow a better flash freeze. Place flash frozen herbs in a bag or plastic container in the freezer. I freeze rosemary whole on the stem, with sage I just freeze the leaves. Drying fresh herbs is very easy. Rinse herbs and pat dry with paper towels. Strip enough leaves off the end of the stems in order to tie a piece of twine around. Gather herbs into bunches, tie with a piece of twine (make sure the twine is long enough to hang upside down). 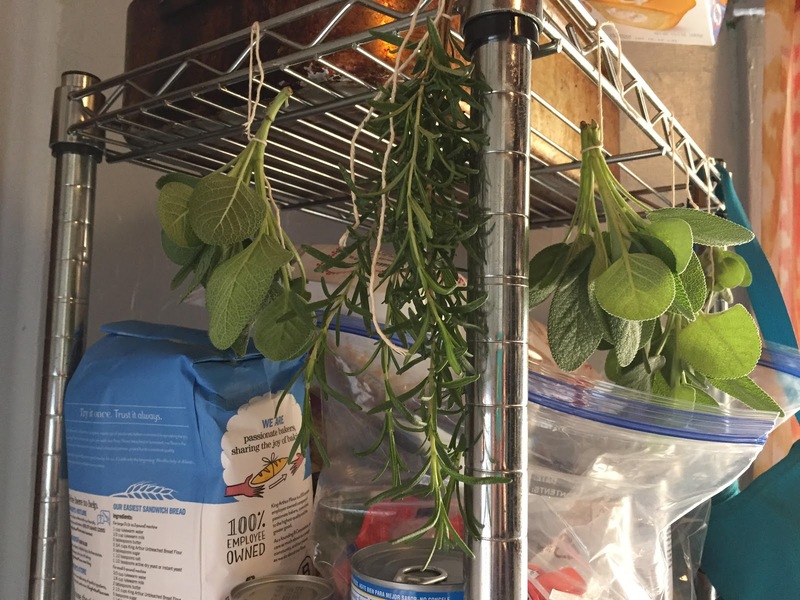 Hang herbs upside down suspended from twine. It normally takes about 3 weeks to fully dry. I store my herbs whole and then when needed I use a mortar and pestle to grind or hand crumble. I find that waiting to grind or chop dried herbs until they are being used helps to keep the flavor of the herb intact. Using the saute setting heat the oil and add cumin seeds, onion, and garlic. Saute until onions begin to caramelize. Add the vegetable stock, then the next 12 ingredients. Add the tomato sauce and diced tomatoes. On the saute setting cook for another 5 minutes. Add salt and top with cilantro. I found this is more of a beans dish, than a chili. Also it needs a lot of salt, and possibly more heat. I think if I made it again I would add some crushed red pepper. The large chunks of tomatoes weren't loved in my house. I might modify in order that fresh tomatoes are used and put in before the pressure setting. 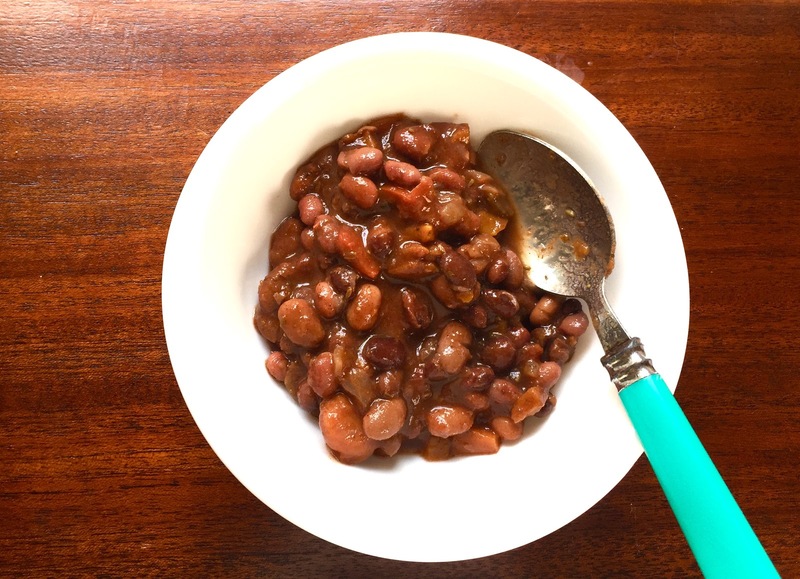 I always soak my beans for the Instant Pot. They come out much better. The one time I didn't they were too firm for my taste. 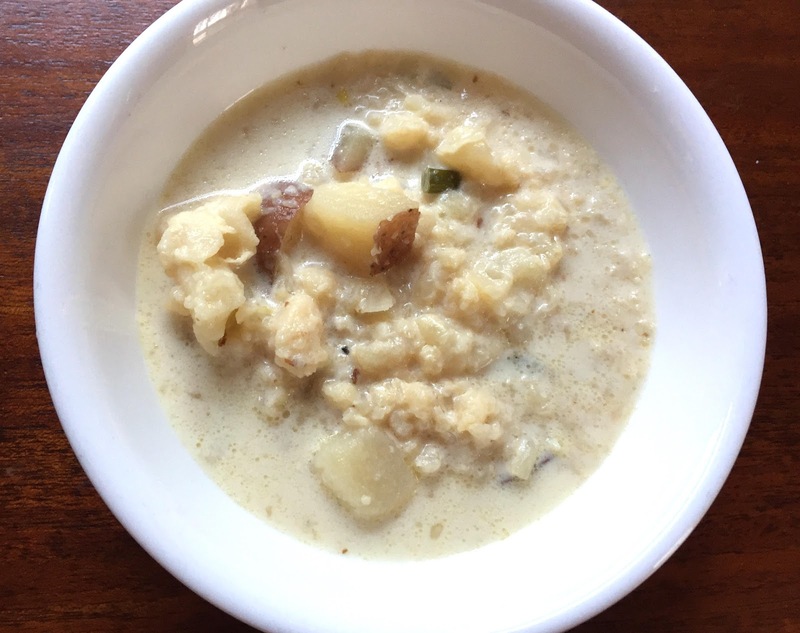 Adapted from Instant Pot Cookbook by Monet Chapin. It's been a long time since I've touched this blog. Approximately three years ago, I became very burnt out with blogging. It started out as fun, and then it wasn't. It took hours to take photos, edit photos, learn SEO, coding......it all became about being noticed and getting paid. I was spending too much time on something, that honestly, didn't really matter at the end of the day. And so I walked away. I loved blogging when I started, it felt like a community. Until it wasn't. When I left it had become more about making money and less about sharing. I found myself being critical of food photos and always comparing myself to everyone else. It became something that wasn't the release from everyday stress that was the reason I started blogging in the first place. So I'm back, but this time I'm older and wiser. I don't intend to make money off this blog, I have found that over the last two years the Internet is full of horrible food recipes. If I have to throw away one more inedible meal, I might scream. So this is my recipe book. Using my iPhone 6 (gasp, that's right my Canon Rebel hasn't been out of the closet in 2 years), I will be documenting the food I make so I can have a place to go back and try recipes that I liked in the past (or avoid recipes that were horrible). Honestly, I don't care if anyone reads or cares about any of my posts. This is about my food journey so I can remember that I can be a pretty decent home cook, even if my photos didn't take 3 hours to stage, capture, and edit. If you're looking for glossy food magazine photos, they won't be here. I don't have the time or patience for that rat race any longer. So here goes. Saute the chopped bacon on the saute option on the instant pot. Once crispy remove from pot. Add the onions to the Instant Pot and saute for 2 minutes. Then add the garlic and one of the chopped green onions. Add the potatoes, bay leaves, and cauliflower. Close the lid and set on the high pressure cooker option for 5 minutes. Do a quick release once it beeps as done. Remove bay leaves and then add the heavy cream. Cook on the saute setting until the soup thickens. Top with bacon and chopped green onions. This recipe need a lot of additional salt at the end of cooking. It turned out really well though, it might benefit from a little spice (maybe crushed red pepper. Adapted from Instant Cookbook by Monet Chapin.